Earn $3.82 in Rewards credit (382 points) What's This? When you're out on a multi-day backpacking trip, sometimes you've got to get creative on the roads you ride. 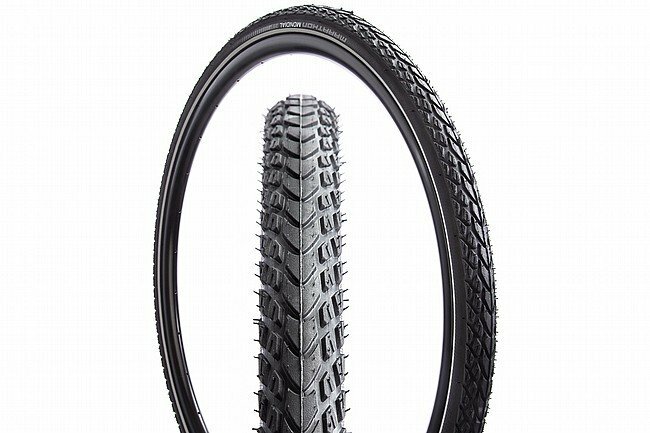 Whether you're riding pristine blacktop or something that's a vague improvement over a washboard, the Schwalbe Marathon Mondial 27.5 inch tire is ready for action. The Marathon Mondial's pay homage to their predecessor the Marathon XR with an aggressive tread pattern capable of ripping down the road or grinding out gravel. Of course, these Marathon's feature the same puncture protection you've come to expect thanks to the Double Defense V-Guard reinforced sidewalls and tread. Now all the puncture protection in the world isn't going to mean squat if it feels like you're riding on concrete blocks, and with the TravelStar compound these tires deliver cloud-like comfort mile after mile.